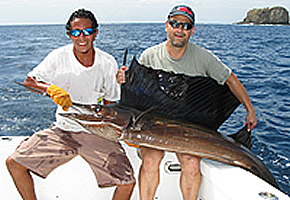 The Billfish Report is counting down the top billfisheries of 2009 – and coming in at #10 is Costa Rica. Sailfish caught on board Warren Sellers's "Bad Dog"
Costa Rica is well-known for its mixed bag of billfish – one can see Pacific sailfish, blue marlin, and black marlin on almost any day of the year…with some occasional appearances of striped marlin. Typically the best months for marlin are in the fall – but any day can be a great one for billfish here. 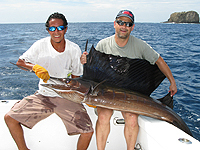 That said, Pacific sailfish are what are truly prolific in Costa Rica, and this year was no different. We saw constant reports of sailfish, throughout the year, with the upper end being 15-20 sails raised in given days. So Costa Rica ranks #10 for 2009 because of its consistent bite throughout the year, its huge numbers of sailfish, and the variety of marlin mixed in, some with some size. – Some good sized blues caught this year, with some decent numbers. Some notables: 400 (Golfito, September), 375 (Golfito, November), 350 (Tamarindo, August) But the numbers of fish, especially in season, stood out: The Clean Sweep won the Los Suenos Invitational with four blues (and 11 sails), with many boats seeing as many as four to five a day at times throughout the year. – Sailfish sometimes came in huge numbers. In June, Jaco was seeing upwards of 20 sails raised per day. In September, the Sea Swirl went 15-20 on sails in one day. Quepos saw double digits routinely in July…in August, Flamingo was seeing between five and 13 a day. – Terrific variety. Black marlin were seen sporadically throughout the year (April, May, July, August, November), to 500 pounds; Quepos had a great June bite on blacks, seeing one to two a day. A striped marlin or two were also caught this year, most recently as part of a Los Suenos grand slam in November…one of several grand slams seen in Costa Rica – clearly one of the best places in the world to get a slam. So Costa Rica comes in as the Billfish Report’s #10 Billfishery of the Year. Stay tuned for #9, coming next week! lets get that number to 6or 7 next year ahahahah. I like the top 10 very nice in deed!! !